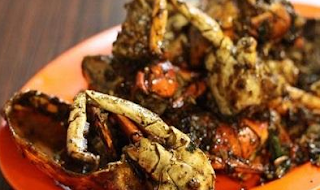 Recipes to Make Tasty Black Pepper Crab Favors -Black pepper crab is a recipe made from crab and black pepper mixed together with fresh spices typical of Indonesia so as to produce a tasty and delicious dishes. For those of you who are curious about the taste and want to know the recipe to make black pepper crab , here are materials that need to be prepared and the process of how to make black pepper crab ..
section, each crab. Then set aside. Furthermore, the Heat oil and saute the onion until it feels harum.Kemudian enter crabs and add salt, soy sauce, sugar ,, oyster sauce, black pepper, taoco and water. After that, cover the pan and cook until the spices seen seep and water is shrinking and mature. Lastly, after the water is shrinking and mature, and then lift the black pepper crab and serve in warm along with white rice. 0 Komentar Untuk "Recipes to Make Tasty Black Pepper Crab Favors"